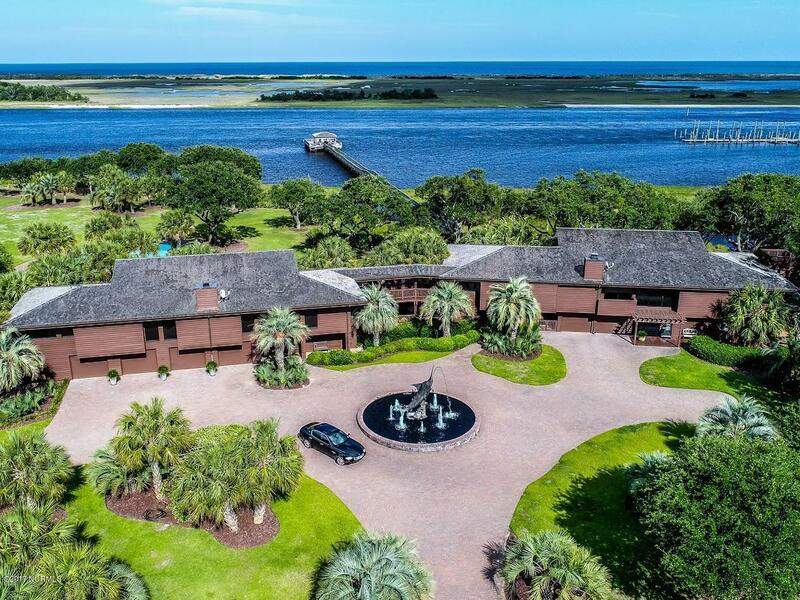 The Sea Lilly is an extraordinary estate, unmatched in Southeastern NC. This tropical retreat, sprawling almost 9 acres, fronts the Intracoastal Waterway and offers panoramic water vistas. It has been designed for a lifestyle of supreme privacy, luxury and tranquility and is the ultimate estate for entertaining. The estate comprises a main residence, a guest house, and a pool house offering a total of 6 BRs, 7.5 baths, 9275 sq. ft. of total living space and a 6-car climate-controlled garage. The resort-like amenities blend seamlessly to create a relaxing oasis and include a pier, gazebo and deck on the Intracoastal Waterway, a salt-water heated pool, a lighted clay tennis court, 50, 100, and 150-yard chipping greens with 3 tees, a lighted basketball court and over 6000 square feet ofporches, decks and patios for additional outdoor living space. The custom electronic gates form an impressive entrance as residents and guests arrive at Sea Lilly and meander along a cobblestone driveway, through incredibly manicured and verdant grounds to the motor court and circular driveway with a jetted fountain and a 20' tall bronze marlin statue as the centerpiece. The expansive lawn gracing the waterfront is helicopter-accessible and ideal for outdoor events. The estate's tropical setting is enhanced with over 1700 palms, including a pond surrounded by lush plantings that is a natural habitat for coastal waterfowl. Each of the residences has stained cedar siding, cedar shake roofs, copper gutters and commercial grade windows. The opulently appointed interiors include shear-wall construction, hardwood floors in all the living areas and bedrooms, cypress trim, marble tile and epicurean-quality kitchens. The Main Residence was originally designed by renowned architect, Haywood Newkirk, and includes 3 Bedrooms, 3.5 baths, a great room with vaulted ceilings and gas-log fireplace, a dining room, a chef's kitchen, office and home gym, all boasting beautiful water views. Connected via a breezeway is the 2 Bedroom, 2 bath, 2800 sq. ft. Guest House built in 2004 and designed to blend cohesively with the main residence. It includes a lavish great room, a dining room, and a granite kitchen with a butler's pantry and upscale appliances. Two levels of decks, ideal for lounging, entertaining or relaxing in the sunken hot tub, provide magnificent views of the lush grounds and the Intracoastal Waterway. The lavish brick cobblestone patio surrounding the pool extends to the almost 2100 sq. ft. Pool House, built in 2005, that opens to a large recreation room on the ground level with seating and dining areas and a kitchen that includes a commercial-grade, large capacity grill. The 2nd floor is ideal for entertaining with an open plan granite kitchen, breakfast bar and great room that opens to a wrap-around deck offering expansive water and pool views. The pool house also offers a guest bedroom, 2 full bathrooms, and a sauna. This unique estate, is ideally located close to shopping, dining, area beaches and marinas. It is perfect for the discerning individual or corporate executive desiring a retreat to relax and enjoy an active lifestyle with family and friends and entertain in style.